Today we propose our readers a second course based on meat: the free range chicken with citrus fruit and Balsamic Vinegar, a recipe half-way between east and west. 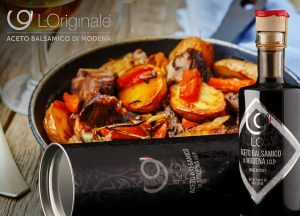 4 tablespoons of Balsamic Vinegar of Modena P.G.I. First of all, season the free range chicken with salt and pepper in a bowl; then massage the meat to let the flavors penetrate and let it rest at room temperature for about 15 minutes. At this point, heat the oil in a large pan and add the chicken. Allow the skin to brown, turning the pieces from time to time for about 10 minutes; then remove them from the stove and dry them with paper towels. Place the meat in a baking tray and bake in a preheated oven at 200 ° C for 25 minutes. In the meantime, rinse the oranges and cut them into wedges without peeling them. Then, put the slices in a thick-bottomed saucepan and pour over Original Balsamic Vinegar of Modena. At this point, cook for 2 minutes to obtain a caramelized seasoning. Remove from heat and add the butter, continuing to mix. At this point, pour the seasoning just prepared in the pan and add a sprig of rosemary. Finally, brown the meat in grill mode for 5 minutes and serve hot. White vinegar. Different usages of vinegar.